[SatNews] ITT Corporation (NYSE:ITT) has received clearance from the Federal Aviation Administration (FAA) for nationwide deployment of the satellite-based air traffic surveillance system, Automatic Dependent Surveillance — Broadcast (ADS-B), marking a major milestone in air traffic management. Achievement of this In Service Decision milestone means that air traffic controllers can now more accurately separate aircraft in the United States with ADS-B coverage by displaying aircraft tracked through the new ADS-B global positioning technology, as well as displaying traditional radar monitoring. Since 2007, ITT has been under contract to the FAA to deploy the ADS-B ground infrastructure in support of the FAA's overall Next Generation Air Transportation System (NextGen) initiative to modernize the U.S. National Airspace System. The commissioning of the system follows the successful ADS-B implementation by ITT at four key sites in Alaska, the Gulf of Mexico, Louisville and Philadelphia, and follows an In Service Decision milestone in 2008 for broadcast safety services. Extensive testing was conducted at the key sites to verify that the system meets its requirements and is safe and secure. Those sites were chosen by the FAA because they provided appropriate environments for operational testing or presented different challenges reflecting the complexity of the nation's airspace. These installations have been a part of the broader program under which ITT has already installed more than 300 of the approximate 794 ADS-B ground stations that will comprise the entire network. 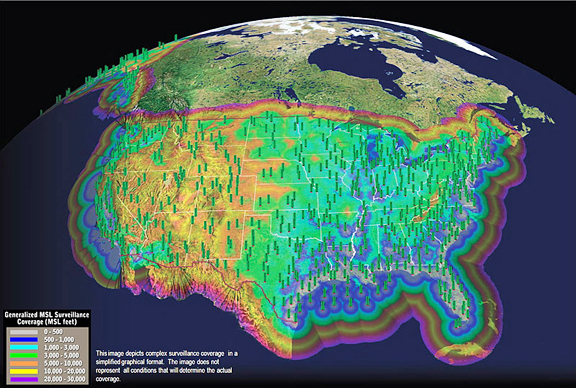 Nationwide ADS-B coverage will be complete in 2013.